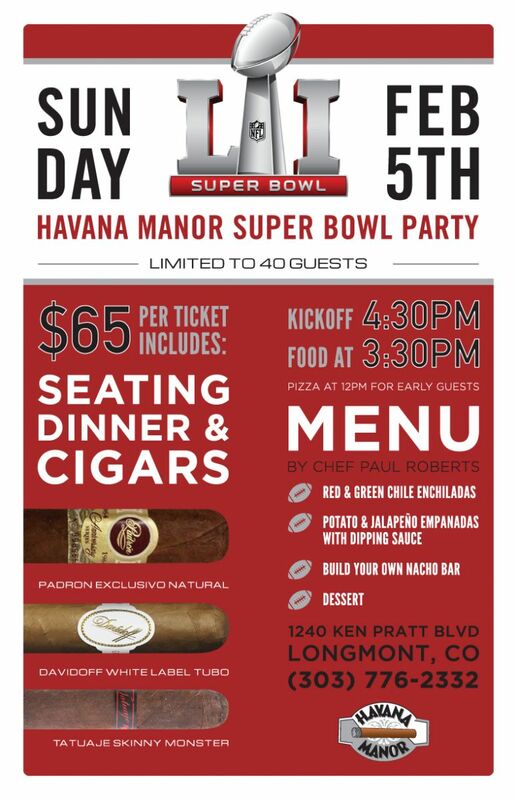 Once again make Havana Manor your destination for the Super Bowl! Tickets for this exclusive event are on sale now for $65.00 per person.In addition to a guaranteed seat, each ticket includes a 3 pack of Ultra Premium Cigars featuring: Davidoff White Label, Tatuaje Skinny Monsters and Padron 1964. Plus, starting at 3:30pm, food prepared by Chef Paul Roberts featuring: Red and Green Enchiladas, Potato & Jalapeno Empanadas with dipping sauce, build your own Nacho Bar, dessert and drinks.Â We will also have pizza availableÂ at noon for guests that arrive early. Purchase your ticket in person at Havana Manor. This entry was posted in Events and tagged Davidoff, Padron, Tatuaje. Bookmark the permalink.